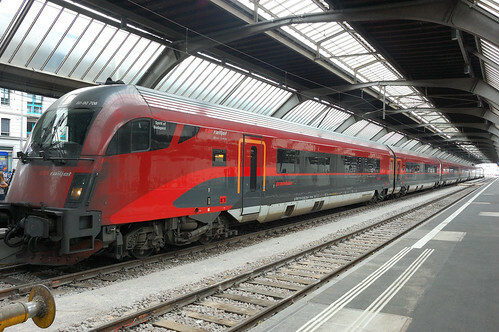 Austrian Railways fast and luxurious RailJet trains connect Wien and Zürich a few times per day via Innsbruck, Salzburg, and Linz in around eight hours. 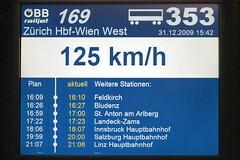 High-speed RailJet (RJ) trains run a few times per day between Zürich Hauptbahnhof in Switzerland and Wien Westbahnhof in Austria. En route, the trains stop at amongst others Linz, Salzburg, Innsbruck, Feldkirch, and Sargans. Tickets for RailJet trains cost the same as regular long-distance trains but the wagons are much more luxurious and comfortable. Special offers are often available and may be as cheap as €29 / CHF35 one way. The Euro Night (EN) sleeper train between Zurich and Vienna is an interesting alternative to the day-time high-speed RailJet trains and special deals may make it even cheaper. Austrian Railways (ÖBB) operates luxurious RailJet trains between Vienna and Zurich. On this route, the trains rarely achieve their full high-speed potential but passengers enjoy comfort and luxury rarely seen on standard European trains. RailJet’s traveling times between Vienna and Zurich are just over eight hours. Each day, four direct RailJet trains connect Zurich with Vienna (and a further train to Innsbruck) while three trains run from Wien Westbahnhof to Zürich Hauptbahnhof (and a further two arrive from Salzburg). The RailJet trains usually also stop en route between the Swiss border and Innsbruck at Bludenz, St Anton am Arlberg,and Landeck-Zams. 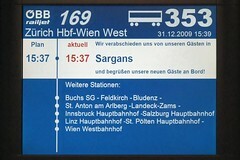 In Switzerland, the Austrian high-speed RailJet trains also stop at Sargans and Buchs SG – both stops handy for travelers connecting to Liechtenstein and Eastern Switzerland. RailJet trains have three classes termed Premium, First, and Economy. 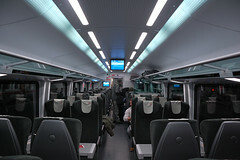 Prices for first class and economy (second) are the same as for regular Euro-City trains but the wagons and seats are generally much more comfortable and luxurious. Tickets for the RailJet are sold online by both Swiss (SBB) and Austrian (ÖBB) railways. The standard one-way fares should be the same but special deals with restrictions are often available. It is worth comparing but keep the strict conditions in mind before booking the cheapest fares. Currently, the one-way train fare from Vienna to Zurich in economy (second) class is €94 or CHF121 and for first class €156 or CHF201. The surcharge for Premium Class is €25 (but sometimes reduced to €15). The various Swiss and Austrian railway saver cards give further discounts and rail passes may be used as on any other train. 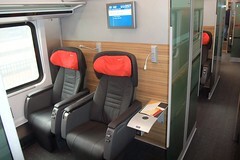 To book a Premium First Class seat on an Austrian RailJet train buy a normal First Class ticket and then make a reservation in a Premium First Class (Premium 1. Klasse) seat. Special discount fares are often available – currently they are more obvious on the Austrian Railways booking system where these SparSchiene offers are clearly marked for dates and times that saver fares are available. Prices can fall to as low as €29 one way from Vienna to Zurich if specific trains are booked. For most leisure travelers it is worth scheduling travel around these cheaper trains if possible. Availability is limited over holidays and weekends but for weekday travel a three-day minimum advance reservation period and committing to a specific train are the only real restrictions. A Euro Night (EN) sleeper train connects Zürich Hauptbahnhof and Wien Westbahnhof overnight in nine hours. These trains offer both luxurious sleeping accommodation and fairly comfortable seats. The seats in these sleeper trains often provide the cheapest train transportation options. The standard one-way fare is CHF93 but SBB Sparpreise can be as low as CHF35 on the same route. For a bed, the fare ranges from CHF121 for a space in a six-person compartment to CHF244 for a single compartment and CHF311 for a single deluxe compartment (with private shower and toilet). The Euro Night (EN) sleeper trains leave Zurich (Vienna) around 10:30 pm and arrive in Vienna (Zurich) at around 7:30 am. A small breakfast is included in the fare and served at the seat.